Income created in the 2018 year; 10%. Income growth rate YOY (Year-Over-Year); 3.7%. Total performance return in the 2018 year; -2.9%. What happens to projected income during market declines? 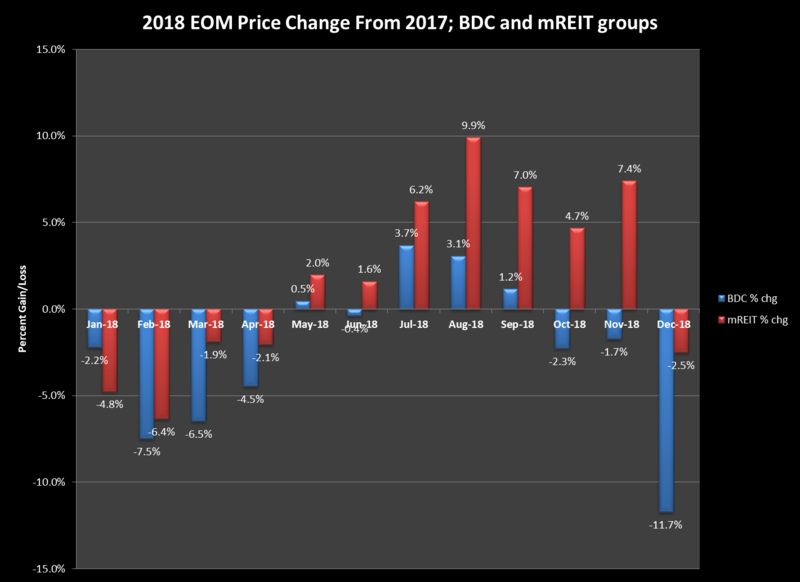 2018 monthly price change for BDCs and mREITs. Watching the market over the years has taught me fundamental analysis can take you so far, but the sentiment of the market prevails when it comes to price. Price can become artificially volatile at times as demonstrated during 2018. Once someone is free of the impediments of price, the market will be reduced to no more than a place to purchase high-income assets that pay on a continual basis. Investing becomes so simple once someone realizes price is manipulated by others, but future income is controlled by the investor. Trust in your own due-diligence with your own investments and purchase when the opportunity presents itself. Market declines are your best friend in adding value (income cash flow) to your portfolio. This is my 5-year anniversary where I have been explaining my investment strategy since 2014. I started my portfolio design with a 10% yield and today this portfolio still produces income over 10%. How is this possible? Simple; my investments generate yield anywhere between 8 to 12% and I just keep buying during all market cycles. To show the viability of such a portfolio built exclusively with high yield assets I'll provide actual results based on brokerage performance reports. People interested in evaluating the 10% high yield process are invited to follow along and track my future performance. 2018 was my first full year in retirement taking distributions from my IRA account. I set the distribution level at 60% (about $29,000) of the total expected dividends at the beginning of 2018 and I have no intentions in changing them in 2019. During this market turmoil, I did exceed my reinvestment plan using some of my distributions along with surplus dividends to keep on buying at discount prices. My actual distribution during 2018 was closer to 45% ($22,362), see Chart-1. Note: all currency in this article has been scaled to my actual portfolio. This portfolio is built with 50% BDCs (Business Development Companies) and 50% mREITs (mortgage Real Estate Investment Trust) including CEFs (Closed End Funds) and ETNs (Exchange Traded Notes). I outlined the 50/50 portfolio based on the concept that BDCs outperform in a bull or flat market (positive correlation), and mREITs, outperform in a bear market (negative correlation) when the FED lower rates. This strategy outlined in an article back in 2014 is the method used in building the 50/50 Portfolio. It must be noted some of the initial stocks have been removed from the original portfolio, because of poor performance. Back studies using the original stocks will be flawed because like most portfolio managers stock selections are not static, but dynamic. Many years have passed and my resolve has been consistent, always focusing on the income and letting price tag along. This strategy has paid off in both my portfolio balance growth and income generation that allowed me to begin taking distributions starting in 2018. In this report I include a comment from a follower that understands the high yield relationship between unrealized price gains/loss and tangible income creation; see section "Follower Comment". I've been talking about this high yield concept between price and income over the past 5 years. Price is what you pay and value is what you get in the production of high-income cash flow. Understanding this principle makes all the difference in controlling your own emotions during market declines. 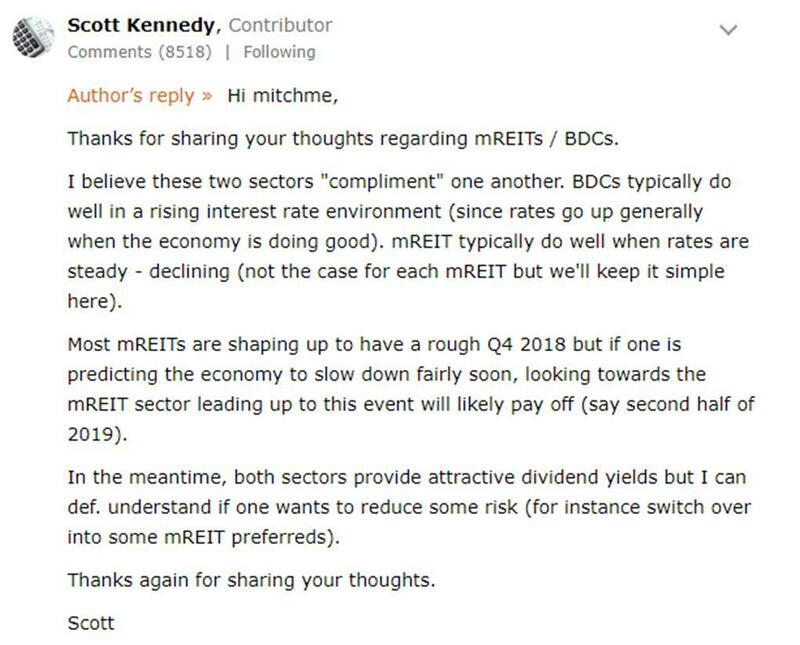 I also include a comment from an SA analyst well known in the community explaining the relationship between BDCs and mREITs during market cycles. BDCs outperform during a growing economy but decline during a bear market. For agency mREITs which hold MBS (Mortgage Backed Securities) paper the opposite is true where they outperform during a declining or bear market; see section "Investing in BDCs and mREITs". My original portfolio design 5 years ago focused on this unique concept to generate income during both market cycles as a buy-hold-collect investor. 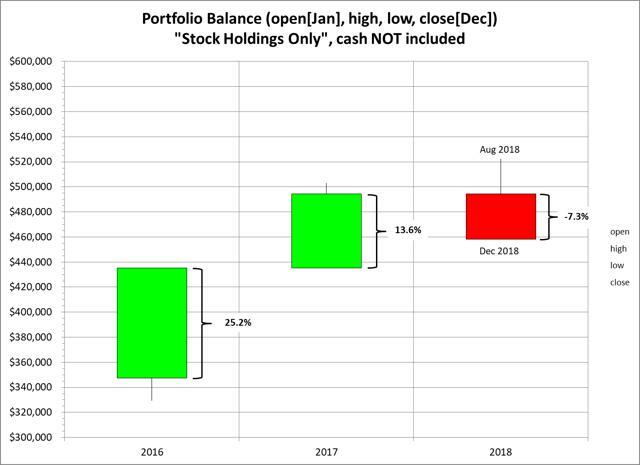 This yearly report includes my IRA brokerage performance metric to track actual portfolio balance, distribution and reinvested surplus dividends. I have designed Chart-1 to display my yearly results since 2014 and to track the performance 5 years into the future. I believe this portfolio will continue to provide cash flow not only for a distribution but also allow growth; reinvesting surplus dividends see section "Performance including distribution and cash". I added Chart-2 and Chart-3 that takes a three-year look-back between the portfolio balance and future projected income. Starting in 2016 I began to collect brokerage account total stock data for both metrics on the last day of each month. An interesting relationship exists between portfolio market balance and projected income; see section "Projected Income Inverse to price". I used the stock bar chart feature in Excel (Opening, High, Low and Closing) basically breaking down the yearly range. This visual feature gives an overview of how high yield price and projected income growth perform during market volatility. Monthly performance between BDC and mREIT groups is displayed in Chart-4. At the end of each month, I record the balance for both the BDC and mREIT groups and display monthly performance (stock holdings only). The highlight of this chart is the group's decline in the worst December on record, see section "BDC and mREIT End Of Month 2018". Also included are daily results for both BDC and mREIT groups and the S&P 500 for the entire 2018 year, see Chart-5. I use the S&P 500 only as a reference to determine market sentiment. Since half of my portfolio contains BDCs and the other half contains mREITs, I have divided my portfolio into two groups for tracking direction. Displayed on this chart is the flatting yield curve between the 3-month and 10-year Treasuries. The inverted yield curve is a possible pretext to a recession; see section "Full-Year 2018 Market Trends; BDC, mREIT". The final section "Current Portfolio Assets" Table-1 and Table-2 list all stocks in the portfolio along with yield and percentage of income allocation. Under the table contains some updates to the portfolio with the anticipation of sustainable dividends during 2019. 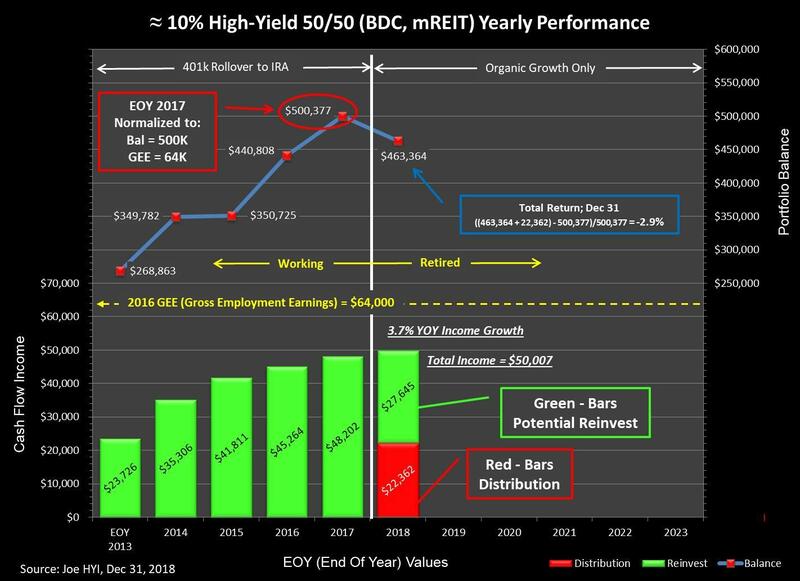 When I write articles I try to focus on many aspects of my high yield investment strategy as shown in my "10% High-Yield 10 Months 2018" article. In every article, I like to provide a teachable concept for all high yield investors. I also want to mention the comment stream as being very insightful for all partakers to engage and participate as a community for all to learn. This platform encourages the sharing of knowledge and ideas and I consider the comment stream to be just as informational as the article. The following comment from "Calico Cat" understands the concept I have been trying to convey through the years. 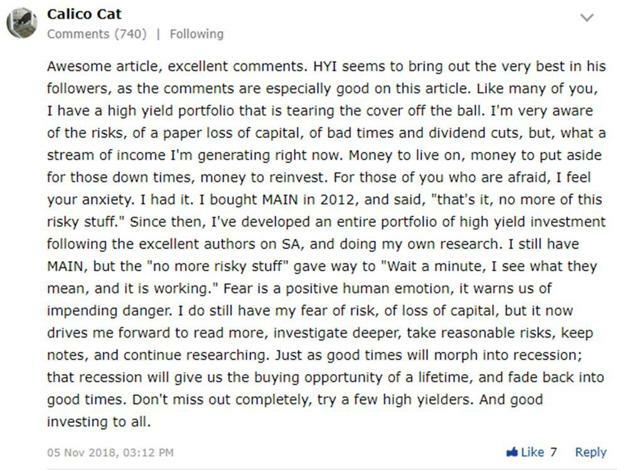 A very intelligent response from Calico Cat based on a simple concept of creating value (high dividend income) from investments and not the manic depressive Mr. Market price manipulation. I want to thank all readers and contributors in the comment stream for sharing ideas with each other. And there are many other great comments that add knowledge and ideas to the conversation and I encourage all to participate. After many years writing articles I know my message is being received by a few people with open minds to accept a new understanding of the market, and high yield investments. When investing in high yield the playing field is completely different and manageable to the degree where the emotional bonds of fear from price is removed and nothing is left except to receive compensation from capital expended. High income is immediately accredited to the bottom line as cash, and not the illusion of paper gains or loss. As I mentioned in my opening statement the reason I have designed my portfolio using only BDCs and mREITs is to provide income during a bull or bear market. The following exchange in the comment section by Scott Kennedy's article on MAIN gets to the decision of my investment method. Scott is an in-depth analyst that breaks down both BDC and mREIT company reports and makes them available to perform our own due-diligence. BDC's will suffer in a recession which we will have in the next 2 years max. I sold all but MAIN as they are best of breed. I have also reduced mREITs as there is so much money chasing that segment. Good luck everyone but I am buckling up and reducing exposure. I get the same type of skeptical comments in my own articles. This is one of the reasons I provided this comment exchange. 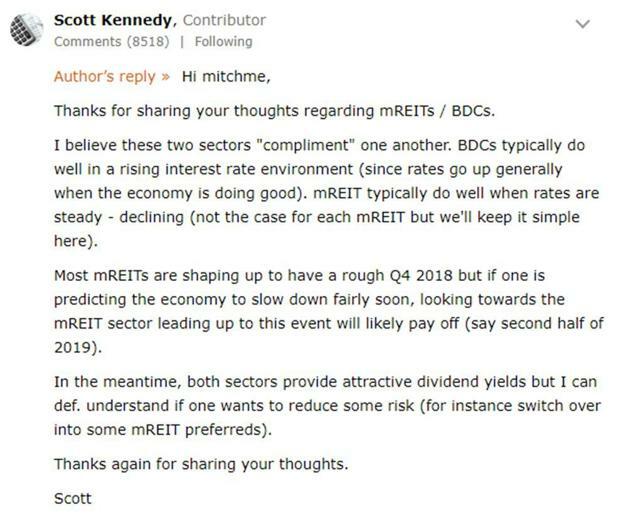 Scott Kennedy is a well-respected analyst in the SA community that should be followed not only for his articles but also for his respectful comment response. I have explained my BDC and mREIT strategy since the beginning of my investment journey. This method is not for the faint of heart and price movement can swing 20 to 30%, but if your fundamental analysis is correct market declines become opportunities. In my own journey, I have experienced many stocks that did not pan-out and quickly found replacements. I'm a terrible market timer, but when I want to dump a stock because of deteriorating fundamentals I take action. For me, the selling and finding a replacement constitutes a lateral transfer of assets to provide a continuous cash flow. This is the rationale behind my replacement method. My intent for the future is finding high yield investments with sustainable dividends. From my original 10-Year Performance Tracking article, I have normalized the portfolio balance to $500,377 and a GEE (Gross Employment Earnings) value of $64,000 starting 2018, see Chart-1. The normalized value is scaled to my real portfolio based on my brokerage performance report. I will keep these values constant to get a sense of future performance and to provide a tangible reference to actual currency. Note1: I have been using my final gross paycheck ($64,000 scaled) as my reference goal. Once my dividends reached 75% of my GEE at the beginning of 2018, it was time to retire at my FRA (Full Retirement Age) and take distributions. All previous articles referenced my GEE as my focused goal. Note2: the full year 2018 results listed in the following items include cash, distributions, along with stock holdings. This chart looks intimidating at first, but only has three tracking elements. I placed a lot of notes on the chart to indicate my pre-retirement working phase and my full retirement starting in 2018; (vertical white line dividing the chart). During the 2014 to 2017 years, I gradually moved my 401k proceeds into an IRA and began purchasing high yield assets according to my current investment strategy. It should be noted the values of the portfolio balance, dividends and distributions are taken from my brokerage account performance table. They keep track of all the contributions (401k to IRA rollover), dividends and distributions during the year where I can get a quick snapshot of all pertinent data. The chart is split in half, the top section is for the portfolio balance (blue line) and the lower half is for reinvested dividends (green bar) along with distributions (red bar). The total dividends (green bar plus red bar) are the actual collected cash deposited into my account each year. For detailed description of this chart please see my original 10-Year Performance Tracking article. At the beginning of 2018, I set my distribution level at 60% (about $29,000) based on expected yearly dividend. My actual distribution level went to 45% ($22,362 see red bar in chart). I used some of my distribution to purchase more shares during the market decline. Note: as a reminder, all currency in this article has been scaled to my actual portfolio. The following two charts show how portfolio price affects "future projected income". I only have three years of monthly history to create both portfolio balance and projected income. Basically, it stands to reason if the portfolio balance is high as in 2016 and 2017 the less income shares can be purchased. If the portfolio value declines as we have experienced in 2018, I can purchase more income producing shares and my projected future income increases. Some people look at their paper losses and stop buying, but I look at market declines as purchasing opportunity, and I certainly went on a spending spree in 2018. NOTE: The following two charts were created with stock holdings only, no distributions or cash added. Actual income received in 2019 will not be the same as future projected income. They will depend on dividend cuts, increases, special dividends and/or changes to holdings. See how the portfolio balance (Chart-2) above is inversely correlated to income (Chart-3) below. Just match each year of balance to income, the higher the balance price the lower the income growth. During 2018 the balance price declined and I did most of my purchasing when Mr. Market was having a hissy-fit. 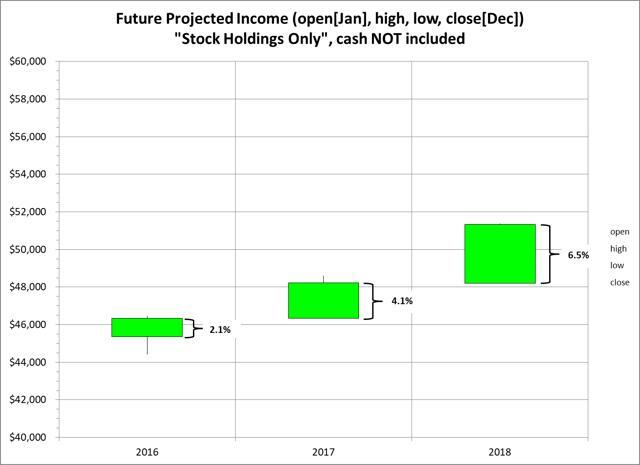 Take a look at Chart-3 projected income in the 2018 year, notice how the income bar has expanded while the market declined. The bottom line, market declines are your friend and accelerate future income. Pay attention to the income your creating instead of the emotional manic depressive market price. High income investing has never been so easy once you understand the mechanics of how the market operates. 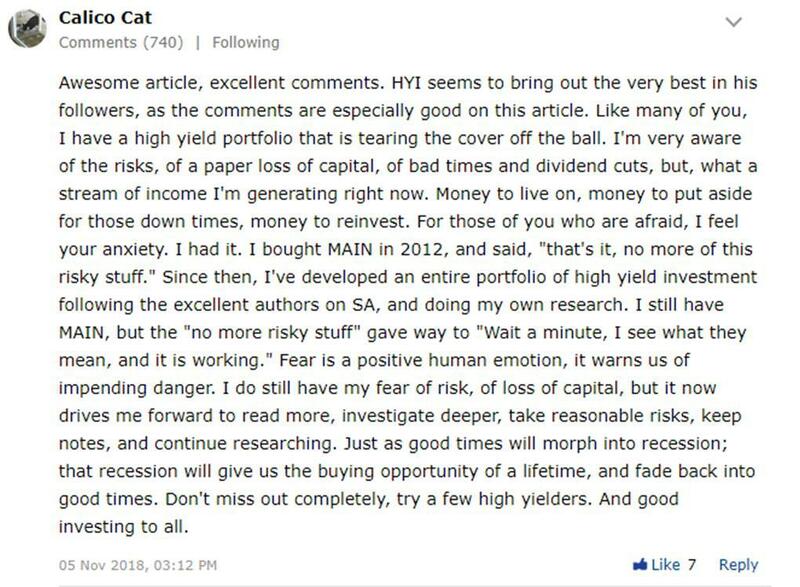 The same line of thinking about high yield compound growth increasing when the market declines come from another (high yield) investor Steve Bavaria working his own set of investments. His "Income Factory" concept of treating your portfolio as a business and not dependent on any single investment is a basic concept we share. Here is a quote from one of his comments explaining this principle, the highlight is mine. It is understanding the principles behind it (the power of compounding and the rule of 72; the advantages both emotional and financial of being able to watch your income grow faster during downturns, like the present one, than during upturns; the realization that the most powerful and dependable "hedge" against market downturns is a steady high-yielding stream of cash coming in continually to be reinvested at bargain prices, etc.) and then putting those principles to work in a portfolio that matches EACH INVESTOR's personal risk/reward comfort level. That may be a 7-8% yielding portfolio for some and an 11-12% distribution level for others. The principle of accelerating compound income growth during a market downturn is counter-intuitive to the institutional market experts that focus on price gains. Generating 10% and higher yield is a whole lot of continual cash to be reinvested, and providing proof of this relationship was the point of Chart-2 and Chart-3. Here is the 2018 performance from the last trading day of 2017; (Stock Holdings Only). This filters the daily price variation by selecting the last day of each month for both BDC and mREIT groups. Notice the blue bar "BDCs" have been struggling all year and the red bar "mREITs" started to move positive since July. BDCs only had 4 positive months and mREITs had 7 positive months during the 2018 year. December was the worst out of all months and this volatility may continue well into the New Year. August 2018 was the best month of the year and December the worst. That's OK with me; I'll just keep buying along the bumpy road to income wealth. The following Chart-5 displays how both my BDCs and mREITs performed along with the S&P 500 during the year. It has been a rough year for investors especially the last four months of 2018. NOTE: this chart displays my current holdings. Some original stocks from the beginning of the year have been replaced. As shown the S&P 500 was declining fast almost reaching bear market territory twice this year, while both BDCs and mREITs are also declining. The market in 2018 was in complete contrast to 2017. While in 2017 the market climbed with very little volatility, 2018 began with high volatility and finished with more volatility. Economic concerns both local and globally including the FED increasing rates and China trade tensions bring uncertainty to the New Year. For the year the price change for my BDC group of stocks (red chart line) ended negative, but adding dividends boosted total return. For the mREIT group of stocks (green chart line) price ended negative, but here again, the dividends added to price helped with total return. This has been a challenging year if someone's focus was only price, but a great year for people adding shares to their income portfolio. Looking at the blue line on the chart (right lower axis), what is interesting is the spread between the 3-month and 10-year rates. I track both Treasures to determine how flat the yield curve becomes for a possible recession. A recent article from a Seeking Alpha contributor " Yield Curve Inversions by Ploutos" describes the 3-month to 10-year spread relationship to market recessions. I run this chart not only to track my BDC and mREIT progress but also watch the flattening yield curve. As the spread keeps declining the recession chatter gets louder and louder. A study by San Francisco Federal Reserve Bank dated August 2018 states; " The difference between the ten-year and three-month Treasury rates is the most useful term spread for forecasting recessions." Banks are watching the 3-month and 10-year yield curve and plan to pull back lending once the curve inverts. This action of pulling back lending may actually cause the recession. Portfolio management principles are focused on income preservation rather than capital appreciation. In retirement, a growing total income cash flow will allow continued distributions, while at the same time provide a steady amount of surplus dividends for year over year income growth. PIMCO Dynamic Credit and Mort. Every $100,000 investment at 11% yield = $11,000 income at today's stock price. This (BDC, mREIT) portfolio has been generating >=10% yield since the beginning of 2014. Each table is sorted by income allocation percentage; the "%IncAlloc" column. The goal for each of the 40 individual stocks is to generate 2.5% of the total income. Some are over-allocated where I do not add to that position but will add to stocks less than 2.5% when surplus dividends are available. I have also identified dividend changes for each company (the last column). This year, my challenge is to find investments that will at least keep their dividends steady. I do not count special dividends toward the investment yield since they can be stopped at any time. To date, I have ten dividend increases and two declines. I sold Monroe Capital Corp. (MRCC) and bought a starter position in SAR and completed full position of CGBD. MRCC is having problems with one of its investments in Rockdale, went from Chapter 11 to chapter 7. A complete write-down would reduce NAV by 6.7%. Note: stock sold may be reentered at a later date depending on future performance. I sold Gladstone Investment (GAIN) and transferred the proceeds to SUNS. GAIN third quarter of 2018 results are starting to have increased non-accruals over 12% and higher equity investments over 35% increasing NAV volatility. If the non-accruals were completely written off it would force the NAV to decline over 10%. Note: stock sold may be reentered at a later date depending on future performance. SUNS, on the other hand, reported good results, where the dividend was covered without the need for fee waivers. In the third quarter of 2018, the portfolio was 100% performing with good credit quality. During the month of December 2018, I had 6 investments pay special dividends that boosted my monthly income quite a bit. In my projected yearly calculations, I do not include special dividends, because they are subject to undistributed earnings that may not occur on a consistent basis. The stocks were FDUS, PCI, MAIN, GBDC, TPVG, and TSLX. An interesting note; MAIN is changing their biannual special dividend payment rolled into their monthly dividend over time. For my accounting, this will be a dividend increase for MAIN. The last time the portfolio performance went negative in 2015, the following year the portfolio went up 26%. The same performance condition setup is happening again. Will we get a big price jump in 2019? I do not know, but checking back this time next year should be interesting. Also notice in Chart-1 the steady climb of income, lower half of chart despite portfolio balance volatility. This is the reason high yield actually works, the constant reinvesting of dividends that produces growth. I know for a fact my income will be a lot higher despite portfolio balance volatility. I perform only one trading function in my account; I press the "buy" button and have no reason to deviate from this action. Investing for income is the only function I can control in all market cycles, I just keep buying. Price is the illusion of despair and a falsehood for the high yield investor. Sometimes patience is the best remedy and taking advantage of price to accumulate more income producing shares will become the best policy. Know the difference between what you can control (increasing income) and what you can't control (manic depressive market price) make all the difference to your emotional response in a declining market. The more the market declines the more I just keep purchasing. Based on previous logic and now confirmation shown in Charts 2 and 3, I actually increase my income growth when the market declines. Fear of price volatility is replaced with the joy of purchasing shares at a discount for future income growth. Thank you for reading, Joe HYI. Disclosure: I am/we are long ALL STOCKS EXCEPT FOR "GAIN" AND "MRCC". I wrote this article myself, and it expresses my own opinions. I am not receiving compensation for it (other than from Seeking Alpha). I have no business relationship with any company whose stock is mentioned in this article.